Caroline Williams, director of Taking Part’s astonishing parallel production Now Is The Time To Say Nothing, tells us more about the making of the show. “The audition for this project was not entirely what one might expect from a casting at a theatre – singing and dancing were not on the agenda. Our quest was to find a group of young people who were brave enough to work together to ask difficult and (perhaps more scarily) simple questions. We were set to make a sound and film installation – our topic was the war in Syria and how experiencing this conflict through various screens, laptops and televisions effects our relationship with the conflict. Before we began the process, I had seen Reem Karssli’s film Every Day, Every Day. Compared to the officious news reports on Syria, Reem’s piece is painfully human in its portrayal of the humdrum reality of living in a conflict. The film is full of beautiful quiet moments but two stuck out: one in which Reem’s sister folds her washing and in a quiet, non-dramatic way explains that she’s lost all hope, another is a rare moment when it snows and Reem is able to go out into the snow and film without fear of bombs or gunfire. After a few crackly Skype calls with the very warm and articulate Reem she excitedly agreed to take part in our project at the Young Vic. Reem was now living safely in Jordan and would allow us to use her footage in our piece as well as be available to devise new material. I had chosen a set in which we played with the experience of watching television. I was interested in thinking about how you could make something on the screen appear to be living in the space, an inkling early on told me that this moment would involve snow. 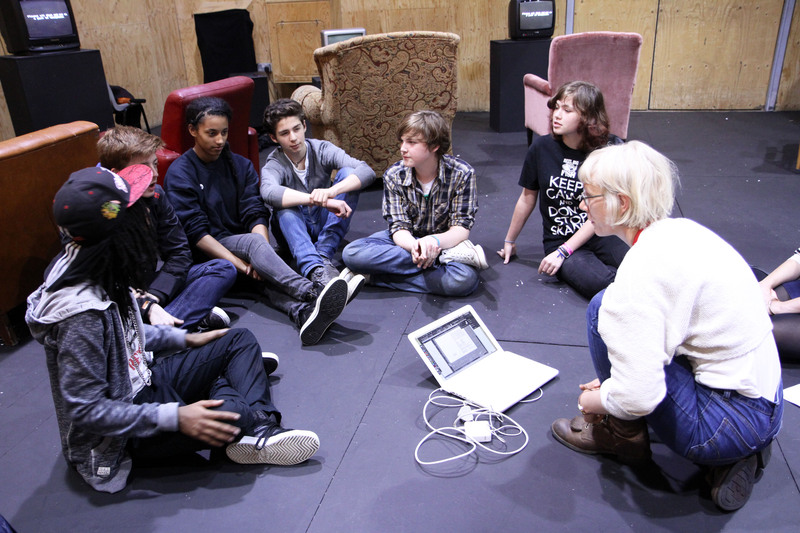 Video artist May Abdalla and sound artist Keir Vine recorded the rehearsals as we introduced the young people to wireless headsets and the technical language of the piece. We learnt about Syria and explored the different media devices through which we hear about conflict abroad. During the first week the group watched Reem’s film and then met her on Skype. They asked Reem questions about Syria and about her life and family. After meeting her the group felt compelled to do something to help. We devised an art action that was performed in Hyde Park. The group found that it was hard to engage people passing by when, unlike them, they didn’t know someone in Syria. At one point one of the group asked ‘how do we make a story where everybody believes they know someone in Syria and that the story is about them?’ We set out to try and write one, playing with a story being second person – how could we hypnotise the audience into believing the story was about them? This entry was posted in Taking Part, Uncategorized. Bookmark the permalink.